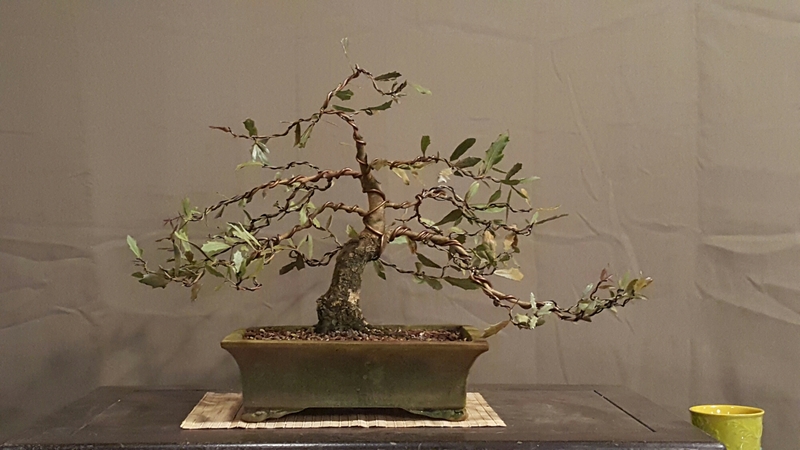 Just wanted to show off a few of the trees we had on display during our Spring Festival. We had a lot of fun during this event and can’t wait to start planning the next one! 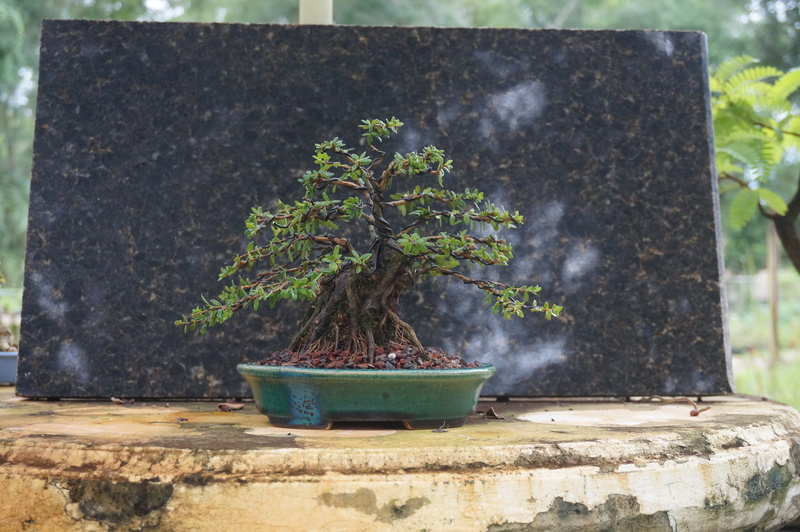 Today we are doing another spotlight on one of the classes that will be offered during our annual Spring Festival here at Schley’s Bonsai and Supplies. Another one taught by our special Guest Artist Sean Smith, and this time you’ll get the chance to build your own bonsai display table. Sean has an extensive background in both carpentry and bonsai so this should be an excellent time for all! 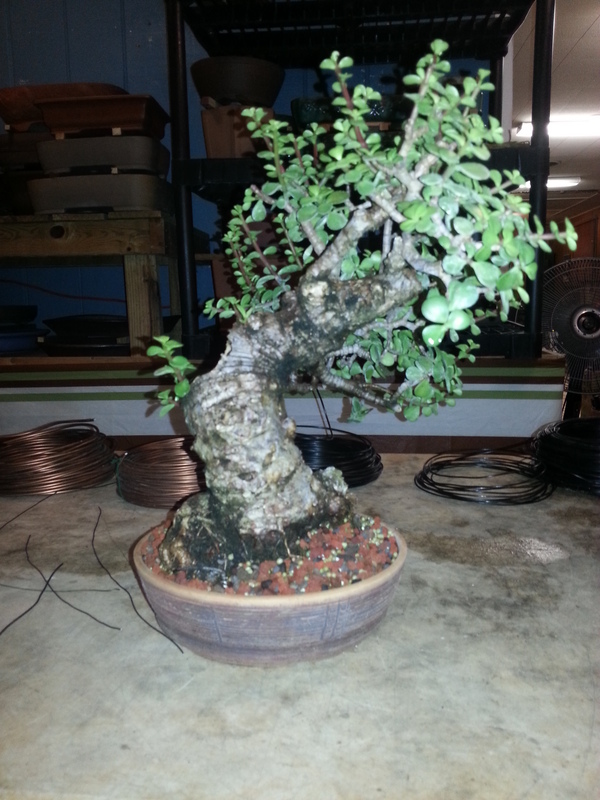 Not only do you get to craft your own table, but Sean will also give a history on how display tables got their start in the realm of bonsai and explain how best to use them. Tips on choosing the right set up, including accent pieces will also be discussed. This is a new class for us here, unlike the root stand carving class which was also featured at our January event (you can sign up for a root stand class during the event by clicking this link). As with our other classes and workshops, lunch is included in the price. By the end of the day, you will be taking home a fully assembled and stained black walnut bonsai stand at less than the cost it would be to purchase the stand outright! Getting to hold these kinds of events and share knowledge about the different aspects in the bonsai world is one of my favorite parts about being in this business. I hope we get to see all of you here in April. Click Here to save your spot before they are all sold out! As always, we will have free beer available during our Spring Festival. On site we will also have a menu of fresh, hot food available for purchase (or free when you participate in one of our classes or workshops). On Sunday morning (April 7th), Sean Smith will be teaching another session of his tall root stand carving class. No experience in woodworking is necessary to participate in this class where you get to take home a work of excellent art at the end of the day. At less than $100, this class is a steal! You’ll want to stick around for the rest of the day Sunday after this class to catch a free demonstration as well. And, following the final two classes of the event, the three bonsai demonstration trees from the weekend will be raffled off! To sign up for this class (or one of the many others) visit our website or Click Here. Admission is free and open to all who want to make the trip out here in DeLand to learn more about an ancient art. We are getting close and are excited to share this wonderful time with all of you! Hey everybody, our January event was super fun but now we are gearing up again for something even better! Like with the winter event, everything at the shop will be 20% off during the festival. And beyond that, we have a weekend jam-packed with things to do! This year it takes place Friday through Sunday, April 5th, 6th, and 7th. Our Guest Artist, Sean Smith, is returning this April and will be taking the lead in several classes, workshops, and demos. As usual this event will have FREE BEER as well as lunch available on site (included in the cost of the classes and workshops). 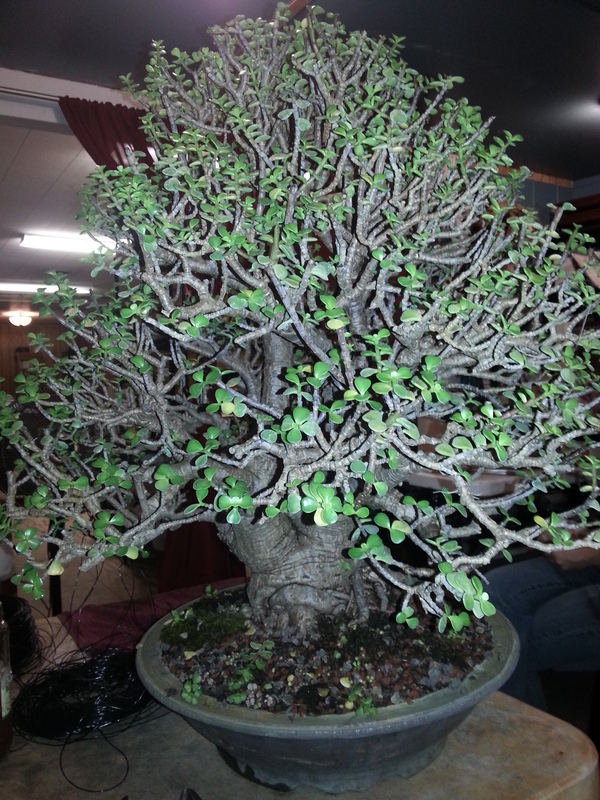 New this year is our bonsai display area, if you are interested in having your bonsai on display during the event, contact Jason at schleybonsai@aol.com or call (386) 675-3118 for more information. During this event there will be free demonstrations each day. For more information about the individual classes and workshops, CLICK HERE. We have been working hard to bring in new inventory as we prepare for our upcoming event. We want to have lots of stock and finished trees on offer to make the drive out here worth it for all of you. More than just having our guest artists at the shop to expand your knowledge, we want to have a selection of trees that speak to each and every one of you. After spending the weekend picking up several truck loads of new stock, I’d be lying if I said my back didn’t ache. Who knew this getting older thing would stick? Fortunately for me, one of my Christmas presents this year was a back massager. I’ve needed it more than once after picking up and transporting hundreds of trees. So. Much. Lifting. Now all we have to do is weed them. And organize. And trim. And…okay, so, work isn’t done yet but I’m excited to get to it and to experience our Winter Event with all of you. One of my favorite parts of this job is leading other people into this hobby, watching them learn and grow as the years go along. It’s always so rewarding when someone comes to bonsai with fresh eyes and excitement. 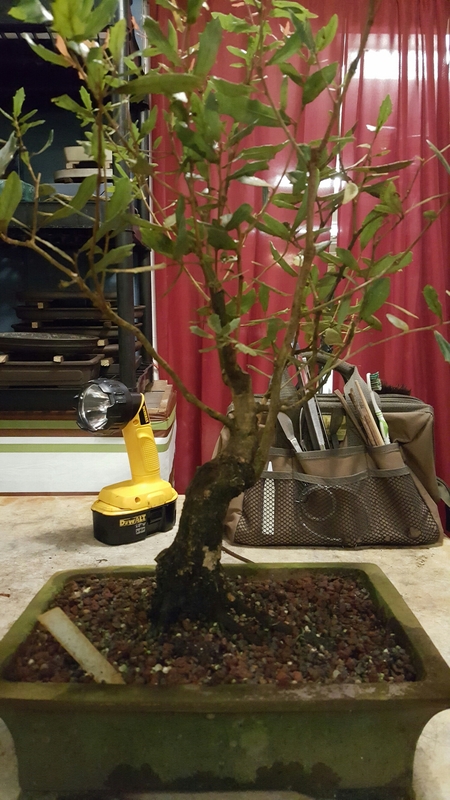 I’ve been doing this for over twenty years and there is still little I enjoy more than watching someone fall in love with bonsai for the first time. Obviously bonsai is no longer just a hobby for me, I chose to focus on it and to make it an every day, pivotal part of my life and I wouldn’t change that for anything. But even without starting a nursery yourself, you can incorporate some of the skills, teachings, and general atmosphere surrounding this hobby into your every day life. Bonsai teaches us patience, gentleness, and thoughtfulness. These things can be hard to find in this day and age. But with this art form, we can take a page from a way of life that at times feels unreachable with the constant rush of modern life. In the simple moments you take every week to care for your own bonsai, you gain a snippet of quiet contemplation and a connection with nature. Happy New Year, everyone. May 2019 bring you peace and prosperity. I look forward to keeping up with this blog again and getting to share a slice of life with all of you. Thank you for being part of this journey! Coming to our event? Let us know! You can RSVP on our Event Page on Facebook HERE. Hey everybody, I figured I’d get out a blog post because I finally finished this tree and am working on a few more from the same batch. This type is Bahama berry (Nashia inaguensis), which aren’t really trees per se. I thought it turned out pretty well. Bahama berry is native to Aruba but a few of the nurseries down in South Florida carry them. I first heard of this type from a sweet couple who used to grow them from cuttings. Incidentally, they are the ones who started me on the path to retailing bonsai back in 1997 when I bought their collection. In that collection were about ten of this type of plant, this is one of four that I still have from that original batch. In the last 17 or so years I’ve made at least a thousand cuttings from those original ten. It is definitely a tropical, for about five years I had them in the ground and every time it got below 40, even with a frost blanket, they would lose most leaves, stop growing, and pout. Their biggest problem is that they don’t like to dry out ever. As Mary Miller stated years ago, another name for them is “I Dry, I Die”. Hey everybody. It’s officially the hottest part of the summer here in Florida, but the silver lining is now it’s going to start to get cooler and cooler as we head off to Fall. Plus, the daily rains we’ve had for the last few months is also a reprieve from the heat. Not so much for the humidity. 90% nonstop humidity isn’t for everyone. Sweating standing still is an acquired taste. However, we don’t really have a winter here, which is the reason I live here in the south. Six months of perfect weather, Can’t wait. That said, this is the time to do all the tropical tree work, and we are in full swing. I started repotting once the nights were above 55 so the roots would recover. That’s usually around April 1st here in central Florida, and I continue to repot and frankly beat up my tropicals till around Sept 15th. The reason why we stop when it’s pretty hot is because the roots typically need 6 weeks of active growth to recover, and November 1st is the beginning of when we sometimes see nights below 55F. Till then, it’s “beat the band” till we get it done. And this year we got it done. 500 new trees in containers. With another 100 to finish up the season. Also, I have been finally styling up some trees again. I got so hung up on the repotting, that I had missed out on the styling . I always forget how much I love this job, Until I get wire on some trees. This time, I decided to get a hold of some old jades. These are sweet old trees. One was from a tree I had sold as a “mature” bonsai ten years ago, one was from a collection that the original owner got from Jim Smith, and one was from Jim Moody’s nursery that his grandson now maintains and improves. Here are some of the before pictures. I repotted this in May, with the intention of wiring it once it was established. It is now pretty established, with new growth everywhere and roots coming out the bottom. And here is what it looked like after a couple hours of trimming and wiring. And this guy. This is the tree I sold ten years ago. The previous owner has very good at keeping trees healthy, but only used shears to keep growth in check. Time for some work. Still too many branches. Ahh. Better. Now the wiring begins. Final Product. I like the pot, but I’m going to change it up a bit. Here it is wired up. 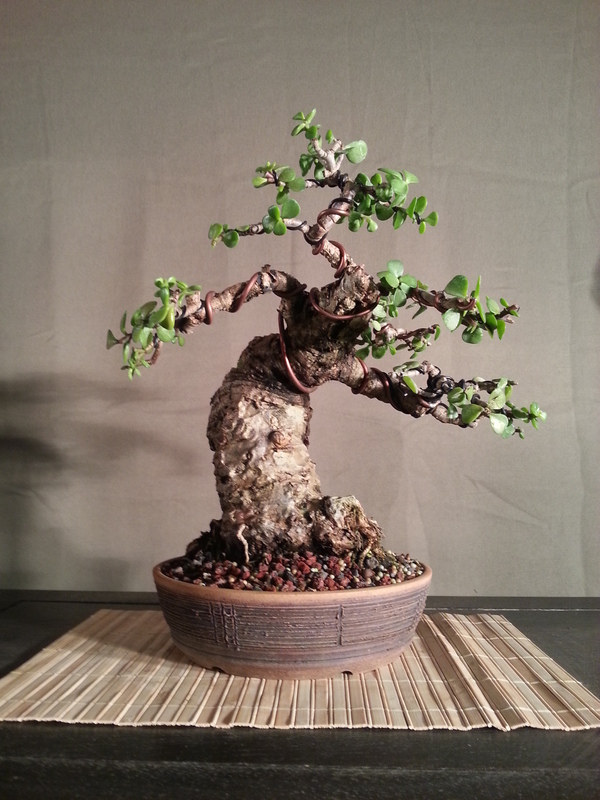 1)”don’t see jades as bonsai”. Why? Succulent growth for one. I don’t think that carries weight. For one, some Ficus are darn near close to succulents, and we use them in the world in many if not all tropical areas because they grow there and are just plain tough to kill. 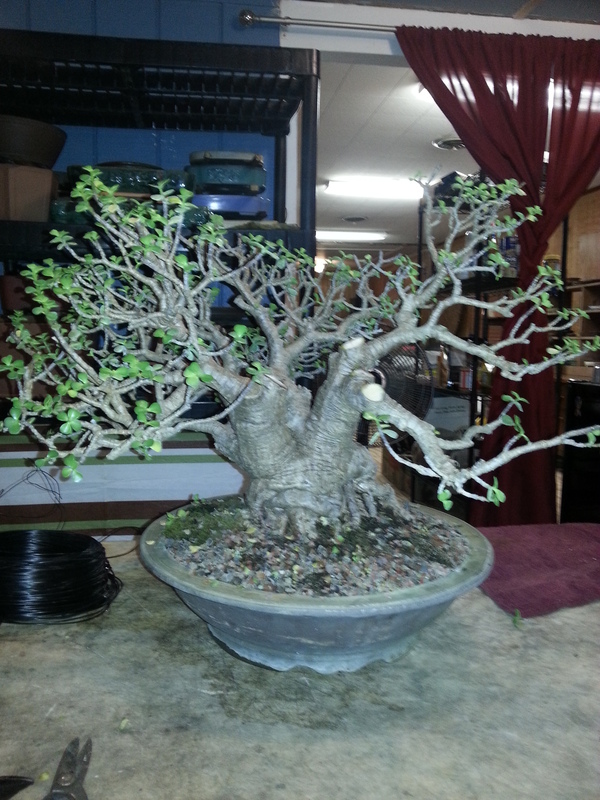 Boababs, though rare, also make amazing bonsai. And are VERY succulent trees. Among many others, too many to list, quite frankly. 2) “you can’t wire a jade’. For those folks I say, see above. The other beautiful thing is, if it starts to dig in, take the wire off, the branch sets, and the wire marks pump up like a water balloon. 3)”It doesn’t have a woody trunk” Well, that is very true. It is a succulent trunk. However, it does get a rough bark that gets rougher with age. And some varieties have a very rough, corky bark. The issue with jades in general is, if its kept too wet, too cold, or too shady. Or any combination of the three, you can get rot. Rot is the bane of any succulent. Especially if the trunk is the main focus. Having an entire trunk collapse due to a four day rain has crushed a few folk. To really put a damper on your day is for that to happen after ten years of work. 1)Don’t water after a re-pot till you see new growth. 2)Don’t work roots unless its hot. 3)Don’t put it in the shade. The growth will be long and lanky, and it’ll stay wetter longer. Not good for a succulent. 4)Don’t cut all the leaves off a branch. it might not back bud. I know many people will disagree and show the jades busting out all over after a defoliation from shears , or an elephant. Yes, the elephants do love them, and eat them to the stems. 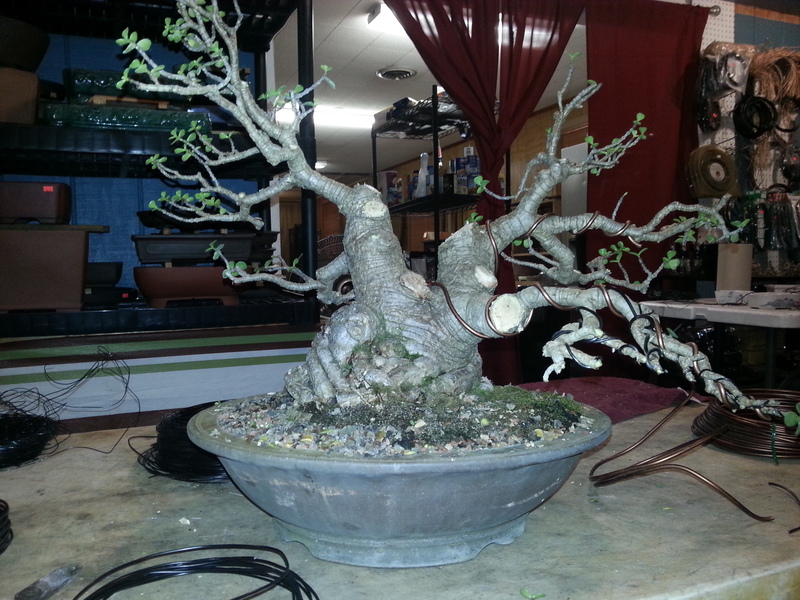 However, in a bonsai pot, it may abort bare branches to focus on new branches close to main trunk. That may set you back a season. Leaving one set of leaves per sub-branch will eliminate the problem. 5) Don’t water once the temp gets below 60 F, unless the leaves start to wilt, and that may take weeks. Root rot is the bane of jades, and water and stressed wet roots on a tropical succulent is a recipe for a seemingly healthy tree. Trust me, it happens. and if the tree is staying wet between watering, slow down your schedule. It’ll root twice as fast. Root the cuttings. If you are so inclined. Nothing says house warming like a sweet little house plant I.E. future bonsai to your friends and family. they root fine in just about anything. These are just guidelines. not rules listed in stone. Jades is a tough plant and tolerates tons of abuse. If you have any other advise, shoot a message in the response section, We may post it for you if its a good one. 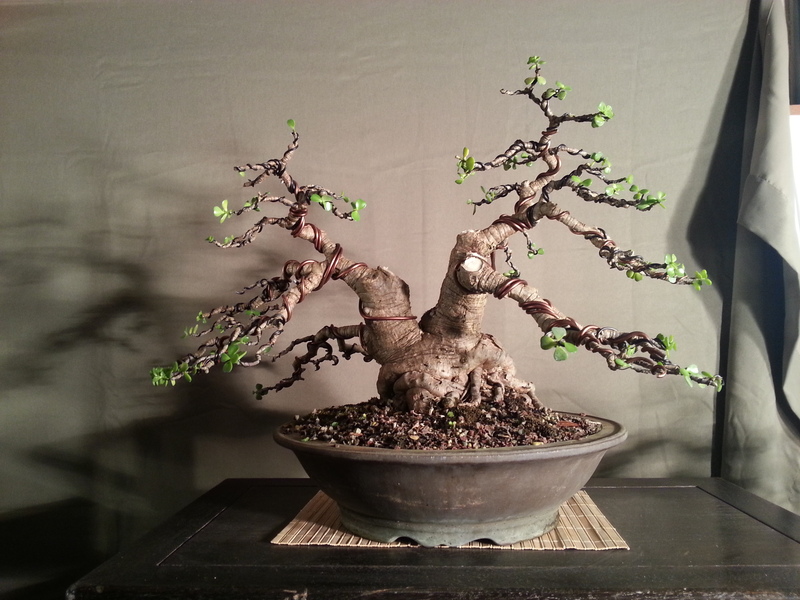 After I saw Jim Smiths Jades at his nursery, back in 98, then later that day at his home, I knew these types of trees could end up being something amazing in the bonsai community, since Jim had obviously already shown everyone the possibilities. I didn’t post a picture out of respect for him, but you can google it and see some of the most amazing HUGE Jades in the US, maybe the world. He has two at Heathcote gardens in Florida if you ever get a chance to visit. I strongly suggest you do. I’m going to start blogging about various types of trees we have at the nursery, to coincide with new inventory we are working and shaping. If you have a type you’d like info on that I have been growing , please put it in the comments section, or send me an Email through our “contact us” section on our website. I am also going to be offering these trees shown on this blog shortly, once wires have set some and they are back-budding profusely.